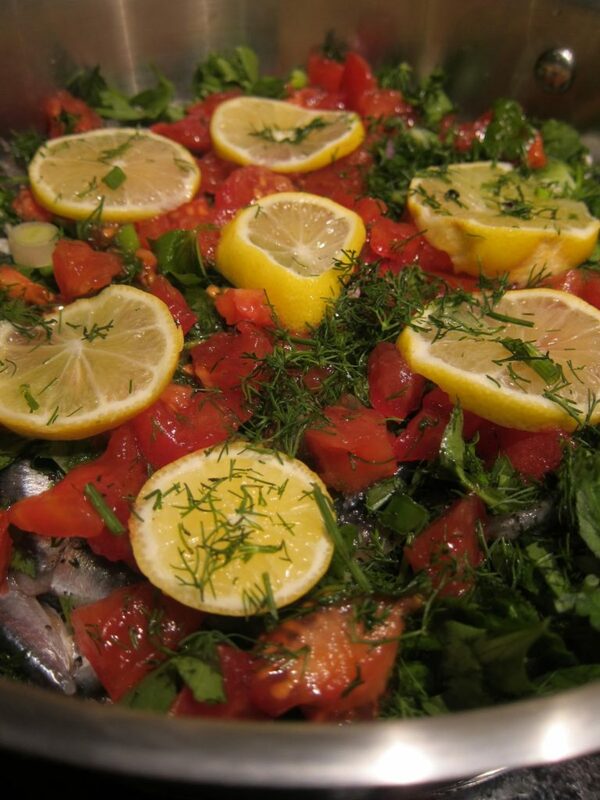 Now is the time to buy those hamsi or anchovies, delight of Turkey food lovers and staple of the local Black Sea cuisine . They are available everywhere in huge amounts glinting under the naked light bulbs which hang over the fish stalls here in Istanbul. The price reflects this huge influx: 4 or 5 TL per kilo. You can’t do better than that! Now, the best way to eat these little beauties is, like any other small fish, fried and with your fingers, but if you are like me, you baulk at frying. There are many favourite hamsi dishes but I like this particular recipe because it’s healthy. Here’s another one with some good pics of hamsi on sale in the fish markets here in Istanbul …. Buğulama literally means steamed but in this case let’s say poached: just a little hot water and ditto olive oil. 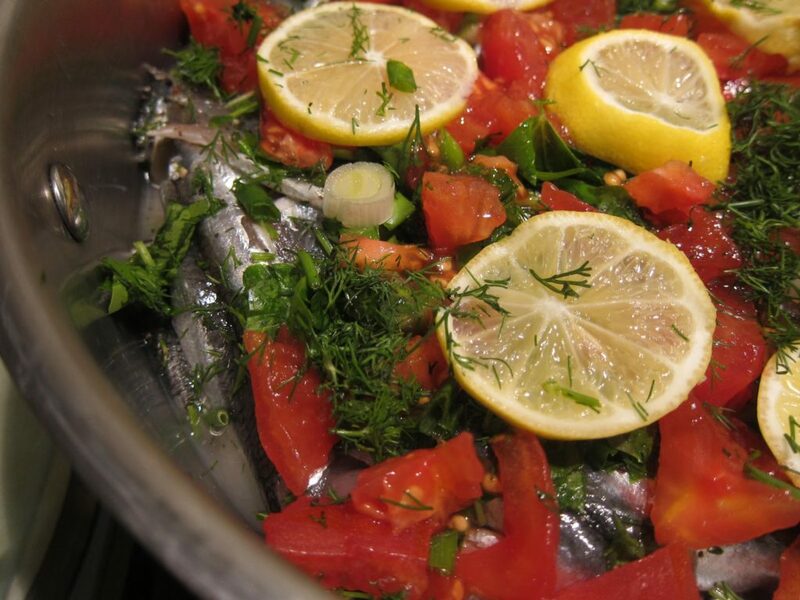 The anchovies are sandwiched between masses of chopped fresh herbs and tomatoes sprinkled lavishly both on the bottom of the pan and then on top of the layer of fish. 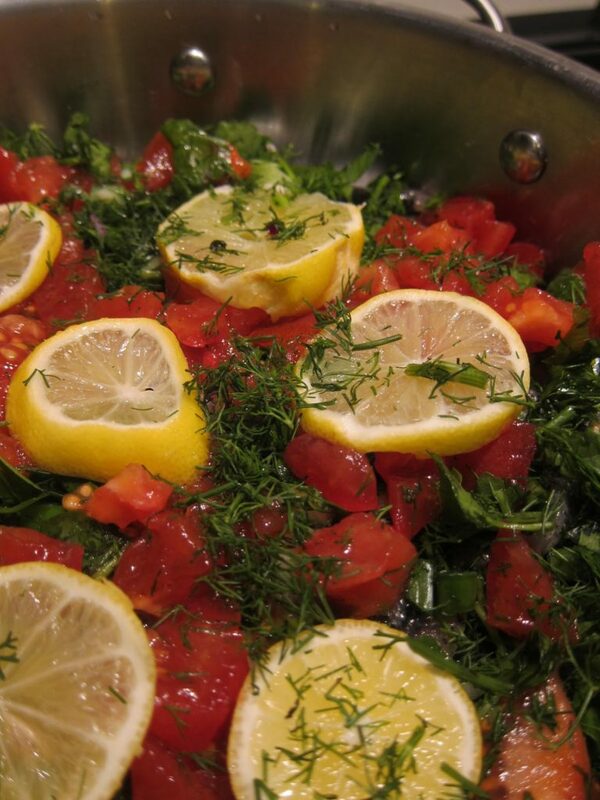 Add some lemon slices, and lo and behold, your fish dinner is all ready to be cooked! Or indeed the dish can be used as a first course which is how I served it the other night along with crusty bread. Dry the fish on absorbent kitchen paper. Mix together the olive oil, tomatoes, spring onions and herbs. Season with salt and freshly ground black pepper and lay half the mixture in a shallow pan. Lay the fish on top and cover with the remaining mixture. QUANTITIES DON’T HAVE TO BE EXACT. Cover with slices of lemon and add enough hot water to just cover the fish. Cover and cook on a moderate heat for 7-10 minutes depending on the size of the fish. Alternatively bake in a moderate oven. Serve with fresh crusty bread as part of a meze spread. Buy your hamsi today and have them tonight! This is probably a silly question, but are the hamsi sold gutted in Istanbul. I don't mind gutting bigger fish but it's so fiddly doing the small ones. Actually, that's a fair question: our local fishmonger sells them completely gutted and ready to go. In Kadıköy, you see packets of cleaned and gutted hamsi also ready to go. Sometimes, depending on how busy the fishmonger is, they won't gut them and then it is a bit of a pain. On the other hand, some people really don't mind contending with head, backbone etc. Sometimes you need to motivate your friendly fishmonger by offering a tip for cleaning … worth every penny, I would say! Hi Joy. Get them cleaned and gutted is my advice. It is not a given that your fishmonger will do this as it depends on how busy he is and how he feels about it. But yes, they should be minus head and tail ..
Claudia, Thanks for the very nice, easy recipe. I've been making a recipe with the hamsi baked and then covered with an onion-tomato sauce that I make on the stove top and baked for a few minutes more. It's good, but I have a feeling that this will be better. BTW, according to my husband who does all fish cleaning, cleaning the hamsi is surprisingly easy once one gets the hang of it – I wouldn't know though. Hi Claudia. I've included your blog in my latest e-book – Turkey, the Raw Guide – as my recommendation of the best site for Turkish recipes and cooking. I hope you don't mind. Afiyet Olsun! Jack, I am completely overwhelmed ….thank you very very much for this. I love anchovies that are part of dishes but as the featured item, I have yet to find a dish that I have truly enjoyed. Maybe if I came to Turkey where they are such a staple in the cooking, I would fall in love with the little guys. Have a great weekend. That looks and sounds so delicious! Here in So Cal it's hard to find fresh anchovies, but this makes me want to hunt some down to try this! !